Snow accumulates on a roof. Solar gain and interior building heat melts the snow. The melt water runs down the roof under the insulating blanket of snow. 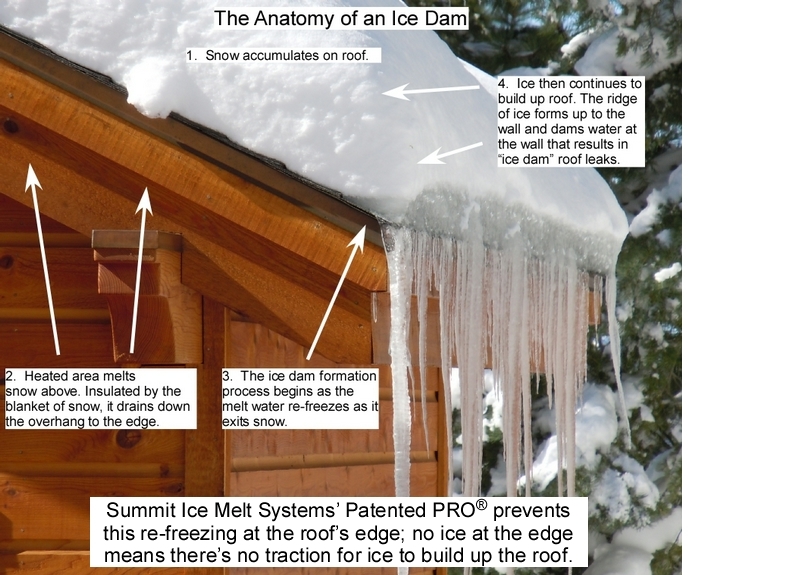 Sub-freezing outdoor temperatures cause the melt water to re-freeze at the roof’s edge, thus causing the ice dam formation and subsequent icicles. Without Summit Ice Melt Systems’ Radiant Edge, the ice continues to grow and build up the roof. When left unabated, ice dams will continue to grow up to the building’s wall line. A pool of standing water develops behind the dam above the wall line. It can then leak into the interior and cause water damage and dry rot. Ice is very, very heavy. Ice formations stress buildings and overhangs, and damage roofing and underlying structures. Ice formations and icicles eventually and unpredictably fall off roofs and damage decks, railings, vehicles, and break windows. Worse yet, falling ice can cause personal injuries.